Port Ellen closed in 1983, and since then its whisky has been highly sought after as it becomes rarer with the passage of time. Located on the Isle of Islay, Port Ellen is known for producing whisky with a distinctive smoky peat flavour that is characteristic of whisky from the island. 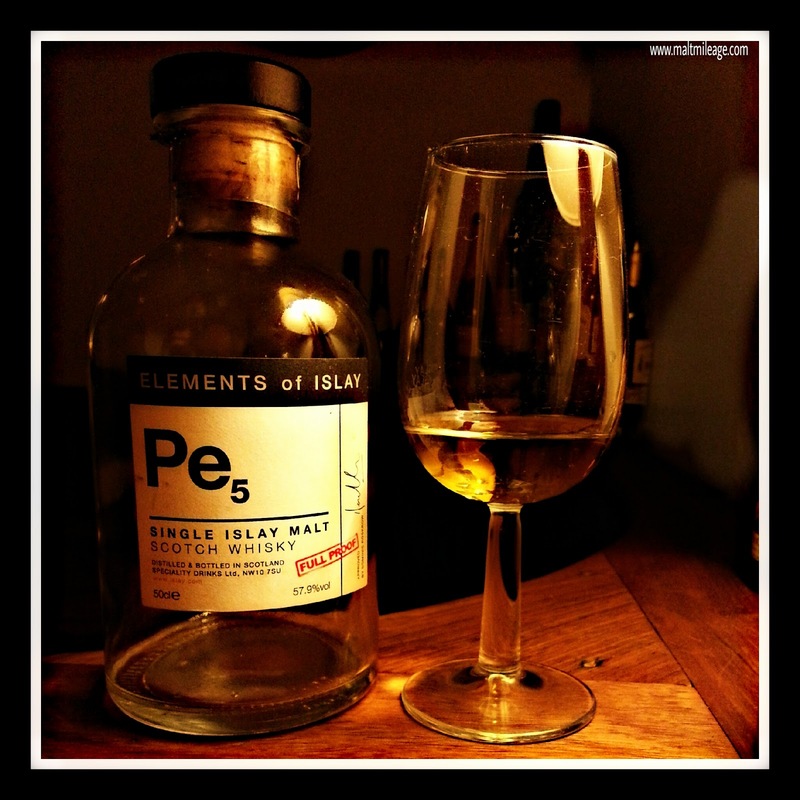 The Elements of Islay Pe5 is part of the “Elements of Islay” range, which offers bottlings of whisky from Islay distilleries which each have their own periodic table like name. 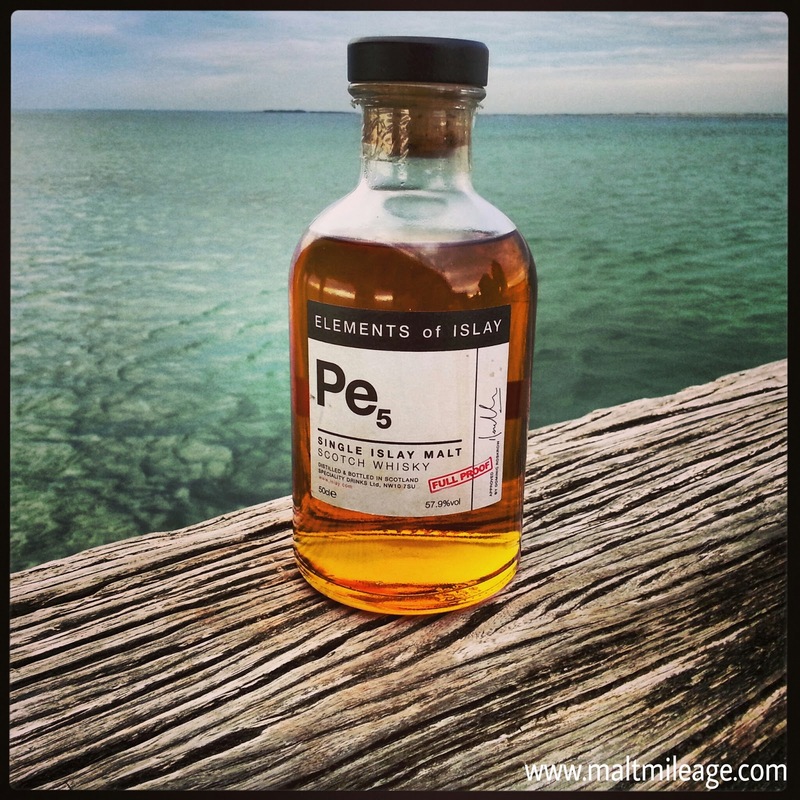 “Pe” is for Port Ellen, and Pe5 signifies that this is the fifth release. Fitting, because whisky is very much influenced by the phenolic compounds and chemistry of oak as it interacts with the new spirit and the previous contents of the cask (sherry, bourbon etc). Elements of Islay Pe5 is taken from whisky that has been aged in ex-sherry casks, and the interaction between the sweet sherry and peat has the potential to be quite magical. The magic does not happen automatically though, because it all depends on how the oak and sherry impart their character into the whisky and this is different for every cask. This is why I think some luck is also needed, though the skill of the distillers, quality of the casks and environment in which the casks are placed are also very important. In relation to this bottling of Port Ellen, everything seems to have fallen into place including the chemistry between the oak, sherry, peat and spirit. Within the smoldering embers burning brightly with peat and the earthy saltiness of the sea sits an “X-factor”; the way the sparks of sherry sweetness interact with the dense peat and oak is almost magical. It releases wonderfully complex shades of peat, sweetness and oak themed character that, when working together, are a an almost perfect symphony. Powerful in the glass, this work of art radiates strong peat without piercing the nostrils as sweet sherry shines like a light house in a smoky storm. The oak plays a perfect role in moderating the peat and sherry, and zesty citrus bitterness wafts up to complete the balancing act. Sweet fig, raisin and prune then shimmer as a gust of sea breeze brings sea salt and the earthiness of the beach. After ten or so minutes, the character in this whisky becomes more complex. The sherry sweetness develops a distinct candy/lolly aroma, as glazed cherries and candied apple weave around dark chocolate and fudge; much like a dense dark Black Forrest mouse cake. Then the smell of cigars is noticeable as a trip down memory lane reveals a childhood favourite raspberry confectionery. This whisky is powerful and elegant, assertive and explosive with a heavenly balance. On a final nosing of this whisky, the character continued to develop as the fudge has notes of mint and peppermint. On the palate a powerful explosion of peat comes with brilliant force. The peat is varied, with notes of dry grass developing into lush green and mossy earthiness. The wonderful sweetness then glows brightly bringing the earthiness and sea salt of the beach with cigar ash and smoky dry wood. That sweetness is spectacular, with particularly dense sherry radiating with the theme of red confectionery identified on the nose. The character on the nose moved to the palate seamlessly, though the surge of peat was more dominant as it delivered burnt wood and shades of vegetation. Heavenly and seemingly endless, the linger of sweet sherry beams through the shades of peat as gusts of soft berries and a sea breeze gently linger on the base of the tongue. Towards the end the magic act then bursts into a plume of dry woody smoke and gradually fades.